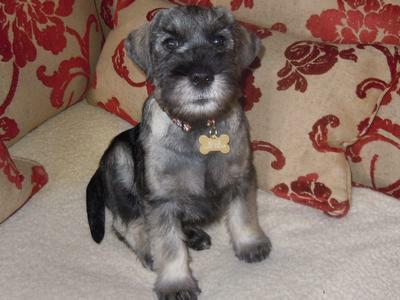 What do you think of our new Standard Schnauzer Puppy 8 weeks old, called Archie, we travelled back with him yesterday, on the 10th November 2012. He dosn't quite know what to make of Paddy our Minature Schnauzer and Bo our Working Cocker Spaniel, I am sure they will all settle in together. You forget what it is like having a new puppy, the house goes to pot and you seem to be clucking around him like an old mother hen making sure he is safe. Archie is a beauty, we're sure he'll settle in soon and get to know who is boss. It might even be him when he's a bit bigger! Thank you Linda, we are so chuffed with this little man. He has certainly livened up today! as you are so kind. Looking forward to christmas morning. Looks like we have a poet in 0ur midst!